An international conference, Methodologies in A ncient Material Culture, is being hosted at the University of Winnipeg and the Winnipeg Art Gallery from October 2-4, 2015. The conference is being organized by Dr. Allison Surtees of the University of Winnipeg’s Department of Classics and Dr. Kate Cooper of the University of Toronto and the Royal Ontario Museum (ROM). The conference will feature 25 speakers from Canada, the United States, and Europe. Speakers include senior and junior scholars, as well as doctoral candidates in the fields of Classics, Art History, Archaeology, and Anthropology. Click here to go the preliminary conference program. Recently, I caught up with Dr. Surtees to ask her for some background about her work, about the conference, and how itt was that she came to be hosting it with Dr. Kate Cooper at the University of Winnipeg. Both Surtees and Cooper had explored methodological approaches to ancient objects as part of their respective doctoral dissertations. The more they talked the more interested they became in the question of methodology in the field of classical art and archaeology, which she explains, has a very different development trajectory than many other archaeological disciplines, due in no small part to the very lengthy history of the field of Classics. The classical world is extremely well documented by literary and other textual evidence, and it is these texts which have been the primary focus of Classics for centuries. And, while, classical texts have been studied almost continuously since antiquity, classical archeology was not developed until the late nineteenth century, with the excavation of sites like Troy and Knossos. At the same time, the practice of “connoisseurship,” which is the use of stylistic criteria to attribute objects to particular known artists or time periods, became popular. This technique was adapted from the Italian art critic Morelli, and it was used to classify ancient art works by particular artists – whether they were named or anonymous. (i) Spectacular objects and monuments and those attributed to famous artists have dominated the field of classical archeology at the expense of more mundane material. This framework also dominates in the classroom and museums, relegating less impressive objects to storage rooms and obscure publications of field reports and catalogues. (ii) Even the better known antiquities have been considered most valuable as complements to Greek and Roman literature, where they were illustrating ancient stories or existed as descriptions by ancient authors. In the study of sculpture, scholars deconstructed the narrative of the rise and fall of art, which had placed Greek sculpture at the apex of creativity and skill and treated Roman sculpture as degenerative and derivative (Zanker 1974; Ridway 1984; Marvin 2008). Scholars studying pottery iconography rejected the treatment of images as mere illustrations of texts and moved to a more complex understanding of the interpretive possibilities of iconography (Snodgrass 1998; Rasmussen and Spivey 1991). Feminist theory and reception studies brought important new perspectives to the study of ancient art by focusing on the viewers of art, rather than on the creators (Kampen 1996; Elsner 1997). According to Surtees, although the old frameworks and traditional approaches persist, the most successful new approaches focus on contextualizing objects from archeological, historical, social, and cultural perspectives. The conference will engage with and challenge the traditional frameworks and present new ways of understanding antiquities by applying new methodological and theoretical frameworks and studying objects previously disregarded. In doing so, we can return objects to their historical frameworks and write the social, cultural, and political history of the ancient world using all manner of evidence available, be it textual or material. In 2013, Surtees and Cooper put together a panel on the topic of methodology in the field of classical art and archaeology for the Annual Meeting of the Classical Association of Canada (CAC), which was hosted by the University of Manitoba. The panel was well received, so they put together a follow-up panel for CAC in 2014, hosted by McGill. It was after the success of that panel that they decided to put together a conference on this subject as a way of learning what other new methodological approaches are being adopted by scholars outside their own networks. 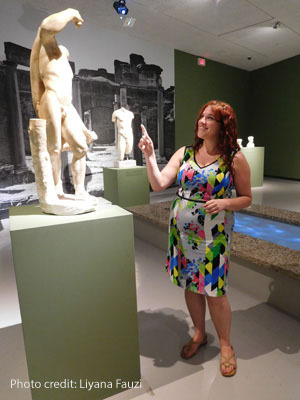 Surtees, by this time, an assistant professor in the Department of Classics at the University of Winnipeg, had just then learned about the Olympus exhibition coming to the Winnipeg Art Gallery. (The exhibit "Olympus: The Greco-Roman Collections of Berlin" is on now at the WAG.) Surtees and Cooper felt that it seemed like a perfect time to hold the conference here in Winnipeg, and partner with the WAG to incorporate the works from Berlin into the event.